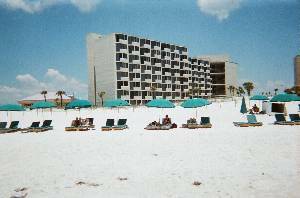 Affordable condo on the beach! Amazing beach view! 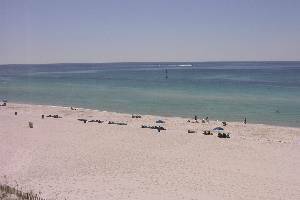 Spacious studio condo right on the beach in Top of the Gulf condominium complex. This complex is in the perfect location, has a huge, beautiful swimming pool, lots of poolside deck space and lounge chairs, is well maintained, and ideal for your family vacation. The condo sleeps 4 people comfortably with a queen size bed and a queen size sofabed. It's equipped with everything you need for your vacation. Just bring a beachtowel and suncreen! 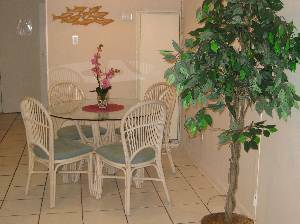 The condo has a fully equipped kitchen; including full-size refrigerator, stove, dishwasher, microwave, coffee pot, toaster and all dishes, pans, silverware, etc. Linens are also furnished. There's a TV, DVD player, VCR, and stereo for your enjoyment while inside the condo. Why is this the condo you'll want to rent? 1) It's right on the beach. No street to cross. 2) Mine faces the beach. The view is awesome! 3) You're renting directly from the owner. This is exactly the condo you're getting, you get a lower rate, the condo is well-maintained because it's my personal condo! You won't want to stay anywhere else! There are no private decks at Top of the Gulf. This picture was taken from a common area deck which overlooks our pool, decks, and of course the beach! Seating for 4 at the dining table. Picture taken from my window. What a view! Looking forward to next year to rent here again! DO NOT STAY HERE! I was promised my deposit back by the owner and now that I left the condo, she refuses to refund it. I had to leave this condo due to the fact that it was not as described at all! There was a moldy spell, awful peeling wallpaper and multiple hairs in the sheets!!! I rented this condo through a different website.. But would like to warn others. Please be aware. Whitley's allegations about the condition of my condo are untrue. I've been renting this condo since 1999 and have never received a complaint like this. She reserved my condo for her honeymoon but decided at the last minute that she wanted a more luxurious condo. I immediately returned the rent money to her so they could go somewhere they liked. 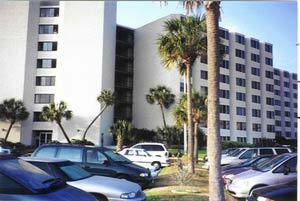 This complex is an affordable complex on the beach (all studio condos). I have had other honeymoon couples who loved it -- primarily because it is right on the beach and has a fantastic view. I'd also like to state that the people who rented right after Whitley loved the condo and plan to come back next year. Whitley fails to understand that the reservation deposit is only refunded if I'm able to rebook the dates, which I was unable to do with a no-notice cancellation. Frankly I'm surprised she was not satisfied with getting the rent refunded promptly (I wanted them to be happy with their honeymoon condo). To expect the reservation deposit to be refunded is unreasonable since I lost those 5 nights of rent. 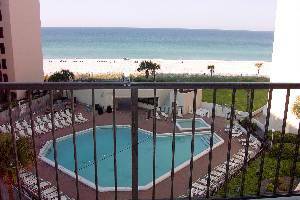 We just returned from PCB and loved this condo. It had eveything we needed except the high price. The bed was very comfortable and so was the furniture. I fell in love with the rocker/glider. I spent a lot of time in it watching the waves and seagulls. You could not ask for a better view. Front row seats to the sunset every evening. Everyone at the property was very friendly and made you feel welcome. The property is in the perfect location, just down the street from resturants and Walmart and less than 5 miles to Pier Park. I am recommending this to all our friends and we will be back. Hi, I'm Lana Marks, the owner of this beachfront condo. I've found that no matter how much my renters love my condo, they don't go back home and log back on to the web site and leave comments. They do however leave comments in my guestbook in the condo. Periodically, I'm going to retrieve the guestbook from the condo and enter the comments that people have left concerning my condo and the experience with dealing with me. Deposit: $100 reservation/security deposit is required. This will be refunded after your stay provided there is no damage. Cancellations and Refunds: Sorry, our complex doesn't allow rental to singles under age 21. Reservation/Security deposit will be refunded upon rebooking minus a $25 admin/bookkeeping fee. Other Fees: Cleaning fee will also apply. Required Stay: Will accommodate most dates.